One Whole Month of Kindergarten! Thanks for coming out to our Ice Cream Social! The Kona Ice truck came to our Ice Cream Social last Friday night. We had games and music. It was a great night of family fun. Thank you Parent Board for putting on this awesome event. Oswald is helping us with the letter O. He loves odd animals like otters and ocelots. He teaches us to make an O by starting with a C and closing it up. Thanks Oswald. We started “Helper of the Day” this week. Our helper has a lot of responsibility; they are in charge of morning business, line leader, coloring our book graph, and many other jobs that pop up daily. They are so helpful to Mrs. Meyer and myself. Empezamos espanol esta semana. Es diverto. Amamos a la senora Paredes. Por favor disfruta espanol. Espero que tenga sentido. Did you know that kids teeth usually fall out in the same order they came in? Only two have come out so far since school started, but I’m sure more will follow! Stay tuned for more toothless smiles. We had our first Fire Drill of the school year this week. We did an excellent job. Our class was able to get out of the building and walk safely to the parking lot. Good job Kindergarten! Please take this opportunity to talk to your child about fire safety. If there was a fire in your house do they know the quickest way out? Our Kindergartners are getting so smart. They are starting to use really interesting clues, sometimes they are tricky! The stumpers this week include; ostrich, octopus and otter pop. 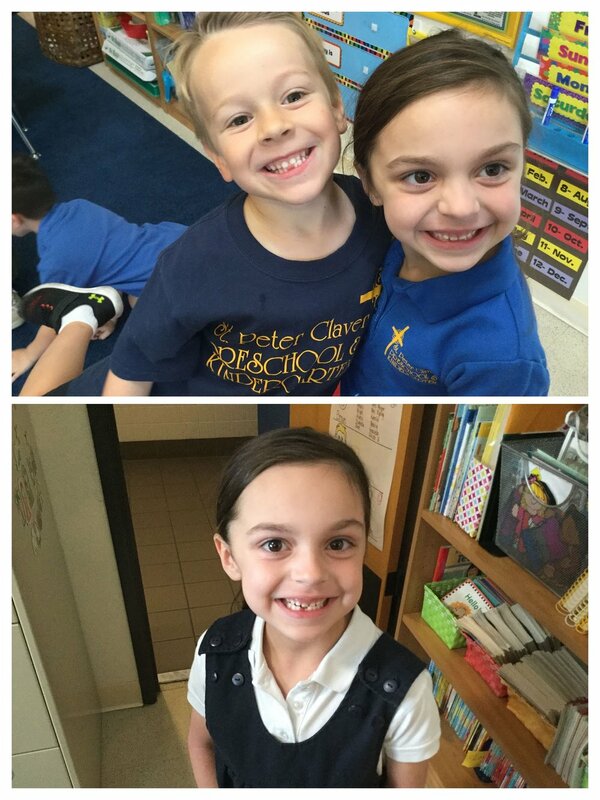 Kindergarten started working with our Study Buddies this week. We helped the TK students construct Little Red Riding Hood characters. This is my favorite part of the day. It makes me really happy to hear the pledge in their little voices. Thank you for another wonderful week. We love our students, they enrich our lives daily. They are so amazing and we are thankful to spend five days a week with them. -Because his teacher said it was a piece of cake!